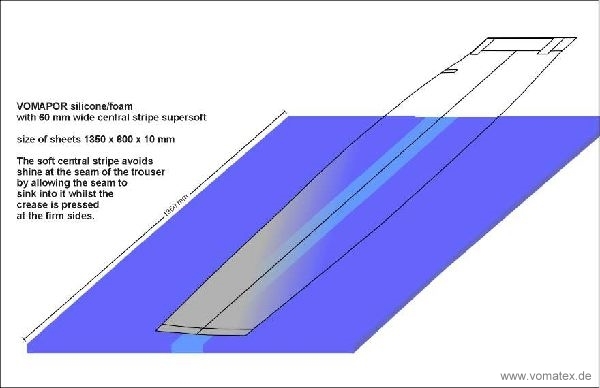 VOMAPOR offers some great advantages compared to other silicone coated foams because of its unique production method using ultrasound vibrations which distribute the silicone evenly within the foam. This technique prevents the formation of air bubbles between the silicone coating and the foam. Pressing a conventional silicone coated foam will destroy the homogeneous silicone surface due to bursting air bubbles. This reduces the heat resistance and the durability of the foam. 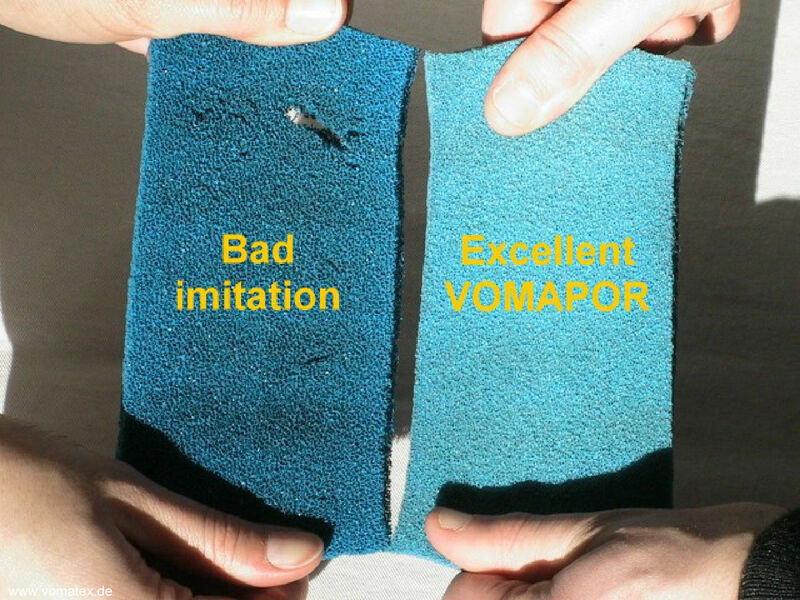 The VOMAPOR silicone/foams avoid these air bubbles, extend the replacement interval and provide a constant ironing quality. Moreover we are using only the best available raw materials for our VOMAPOR which guarantee a long lifetime and which are not hazardous for the environment and the health of your workers and the consumers. especially at ironing delicate clothing. Used as the soft standard intermediate padding. Very durable for constant ironing result. Used as the medium standard intermediate padding. Used as the hard standard intermediate or lower padding. Used as a hard lower padding. Extremely durable for constant ironing result. The VOMAPOR silicone/foam with 60 mm wide supersoft central stripe is especially designed for trouser leg presses. At pressing the crease you often have problems with shine at the side seam. For this reason we developed VOMAPOR sheets with a supersoft central stripe allowing the double seam to sink into the supersoft area whilst the crease is pressed at the firm sides. Because these sheets are produced out of one single piece of foam there will be no marks at the transition between the supersoft central stripe and the firm sides. VOMATEX is producing all VOMAPOR silicone/foams with a unique silicone penetration technique using ultrasound vibrations preventing from the formation of air bubbles between the silicone coating and the foam base. Pressing a conventional silicone coated foam will destroy the homogeneous silicone surface due to bursting air bubbles. This reduces the heat resistance and the life of the foam. The VOMAPOR silicone/foams avoid these air bubbles, extend the replacement interval and provide a constant ironing quality. The laboratory analysis of our VOMAPOR silicone/foam compared to two other silicone coated foams shows the excellent quality of the VOMATEX products. Please download the comparison here. to the metal surface of the machine.